It is near the end of another calendar year, and summer 2019 is quickly approaching. Design and Construction, in the spirit of good partnership, wants to help you plan and prepare for your capital project needs. 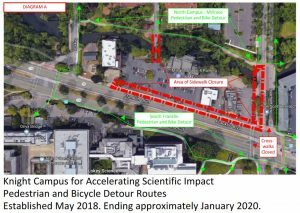 The level of time associated with developing and implementing a campus project may take longer than you might anticipate. Geotechnical investigation will be taking place on the Collier House site lawn area and on the east end of the Gerlinger Field Green on December 14th. Five bores are planned for the Collier House site and one on Gerlinger Field Green. Noise will be generated while the boring drill is active, otherwise no other disruptions are anticipated. A full-size section of the Knight Campus glass building facade will be constructed to test the connections/construction methods for the building exterior. This will be located west of CPS and north of the temporary accounting trailer in the back 40. This will be in place for approximately one year starting October, 23. 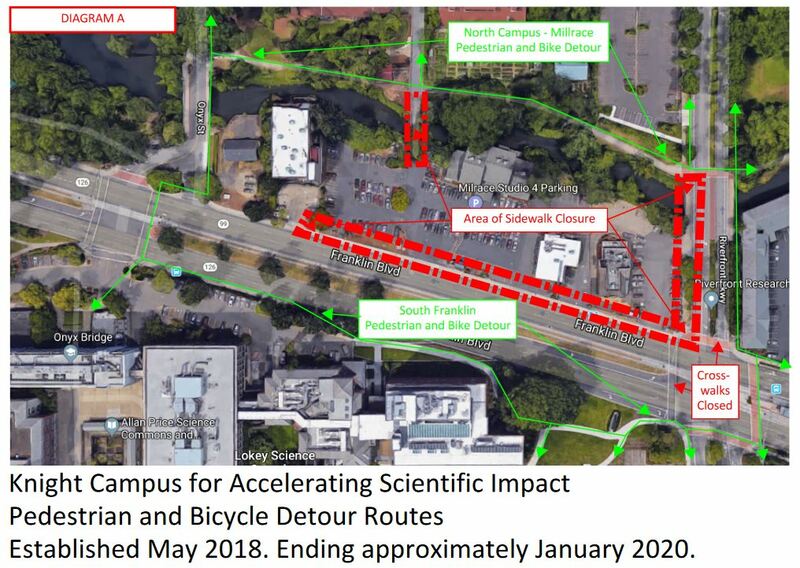 Construction on the Phil and Penny Knight Campus for Accelerating Scientific Impact is ramping up. You can track progress on a web cam and read traffic updates. As part of the Tykeson project, the below logistics map shows the scope of work for the tower crane which will be constructed next Monday, March 5, 2018, and Tuesday, March 6, 2018. 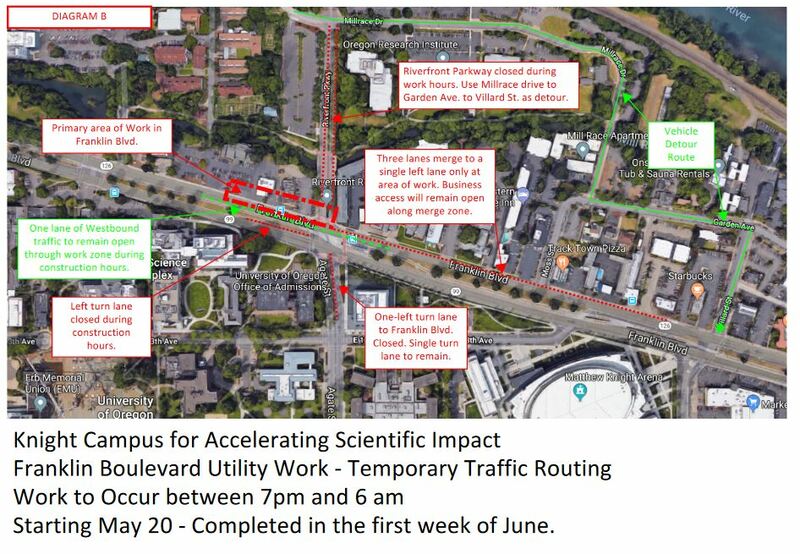 This work requires a truck to be parked in the west end of Johnson lane, north of the access lane to JSMA and Parking Lot #25. A truck will be in place the morning of March 5, starting at 8:00 am and in place all day March 6. Access to the JSMA lot will remain open with a flagger to direct traffic. For questions or concerns please contact CPFM Design and Construction Project Manager Martina Oxoby at 541-346-5880. Happy New Year from Design and Construction! Though the Winter break has just past, now is the time to start planning for any small remodel projects you might be considering in preparation for Fall Term 2018. The summer months are typically when the majority of this project size are constructed. However, depending on project complexity, it can take several months to program, design, and bid projects ahead of the 2018 summer construction season which is June 19, 2018 through September 21, 2018. Design and Construction and our Special Projects team would like to assist you in implementing your small capital project goals. A small project has a typical project value of up to $250k of limited complexity. So we can offer the best possible services to you, all projects must be submitted based on the following schedule in order to be completed this summer. 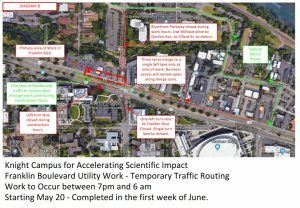 Late project submission places a burden not only to our staff but to the projects that are already in the project queue; and given the current construction climate in Eugene, contractor availability may be limited as summer draws near. may not be possible. A schedule determination will be made during the submittal and scoping process. Project requests should be submitted through our online Capital Projects Initiation Form. If you are not familiar with our project delivery process, feel free to review our on-line Project Toolkit: https://cpfm.uoregon.edu/project-toolkit for helpful information. Also, feel free to review this and other segments of the Design and Construction and CPFM website for additional information and tools for your use. Our office is committed to provide you with the best possible design and construction services. We look forward to your project submission.